I am one of those people who write lists. Not every day. Not that often at all, but when I am really stressing out, I write a list of what I have to do. Let’s say that I might write a list once a week. I am a reoccurring list writer. I don’t know why I am trying to define how often I write lists. Let’s just say that now and then I write a to-do list. 1. I have a tendency to put down things I have already done just so I can check them off. 2. I write down about 100 things, then as I come to realise I am never going to get those things done, start checking them off just because I know they won’t happen anyway. 3. I never really finish one of my lists. I seem to forget that I have made it and just do things as I remember them, and end up throwing out the list. So, I think what we have established today is that I am possibly the most dedicated and equally worst to-do list writer on the planet. I also just noticed that in my post about lists, I managed to have two lists. I think that’s quite a skill of my subconscious really. Or not…. Now, before I start I just want to add that I am all for the coins-in-the-fountain-then-make-a-wish routine. And in no way am I saying that I do not want to visit Trevi Fountain and toss a coin in, in fact I do believe I mentioned my complete aspiration to do so on my “Around the World in Eighty Words” post. However, I do have to speak up for those of us out there who do not have direct access to this famous fountain, or…any fountain for that matter. It has just come to my attention today that I have coins a plenty ready for the tossing, but no fountain to toss! I have to add also that this did not distress me in any way until Daily Prompt decided to draw my attention to this fact so i’m not sure whether to say thank you, or why couldn’t you just leave my mind at ease on the whole fountain/coin tossing debacle? However, fear not fountain-less folk! For Write and Day isn’t here to simply point out the problems, but it is ready to point out the solutions. Now I don’t suggest just chucking coins around like a hooligan, we don’t want anyone getting hurt by unidentified flying currency, but I do suggest some quick fire substitutes to get those wishes a wishin’! 1. DIY Fountain – That’s right I’m talking bird bath, neighbours pool, bathtub, lake, river, ocean, sink, anything where you can squint your eyes, turn your head a little and voila! Trevi Fountain! 3. Donate to Charity – Since 2010, worldwide charity Caritas has been sweeping out Trevi Fountain once a week, and putting the money thrown towards a good cause by helping those in need around the world. So, why not donate your wishing coins, make a wish, and help out those in need while doing it? 4. Go Celebrity Hunting – Two words, one name, Chris Fountain. 5. Get into Calligraphy – I only suggest the calligraphy part for the post-wishing uses. What I am really suggesting is get a fountain pen, and toss some cents at it. So, I hope that this puts all of your minds at ease, knowing that until you finally get to the real deal Trevi, your can still go on wishing into those fountains. Or may I call you Letty? I feel like we have become good friends now. In my seemingly never-ending endeavour to find blog topics, I have often fallen upon your clever words of wisdom. It seems that I often find myself delighted at the sight of you scrolling by in my blog feed. So I do thank you for that, however, I also have some other things I would like to discuss with you. Firstly, I really think you could shorten your name from ‘Open Letter’ to simply ‘Letter’ (although Letty does have a nice ring to it). I suggest this simply due to the fact that you are mostly found on the internet, a public sphere, thus I feel it is already in your nature to be ‘open’ without having to state so. I am certainly not saying that you have to, just a suggestion. Secondly, I have to admit that whenever I read your previously mentioned words of wisdom, I always have that same voice in my head. It seems that no matter your author I just always imagine you being read out by Sir Ian McKellen. Every time I begin, I can’t help but picturing Mr McKellen sitting quietly at his desk, reading you off a perfectly aged scroll, written with the quill of an eagle. So I apologise if you in fact have no resemblance to this figment of my imagination. Nevertheless, I don’t think that this is goodbye, merely farewell. It’s very difficult but very rewarding. Now the difficult part about it is finding things to write about. It seems that getting those writing juices flowing just isn’t as easy coming as I had originally thought. I know, it’s kind of sad that I have only been writing on here for two weeks, and already I have resorted to writing about what it is like to think about what to write about (Huh?). At this point I have to justify my title, because it is unexpected that I have gotten to this point already. However, I am always striving to live up to Write and Day’s tagline, “just a blog, but a bloody good one”, and I am determined not to give up quality for quantity. However, in saying all of this, Write and Day has already been an extremely rewarding experience. Writing posts, and seeing that people are interested in reading them, is so exciting. But more than that, seeing that people are wanting to read what I have written, and are sticking around to see what else I am going to write, is very humbling. So, two weeks in and all is well. And don’t worry, I am not out of posts just yet, I do have a few things in store over the next few weeks! So hopefully, you and I won’t be seeing Blog Log for a while yet. For now, I am going on an adventure! Thanks again, Bilbo. Wise words Dr Seuss, wise words. Ellen, you have done it again. I think we all know which photo I am talking about here (see above), but if you have completely escaped the Twitter-sphere in the past few days, I’m more than happy to fill you in. 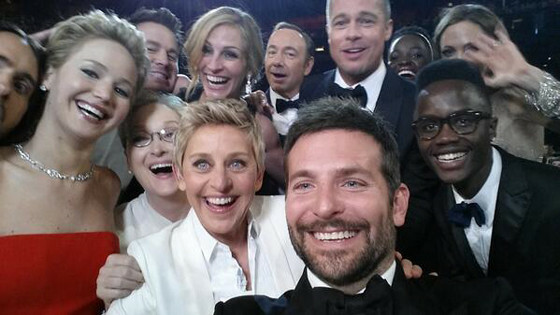 At this years Oscars, comedic genius Ellen DeGeneres managed to get amongst the stars to take, what would ultimately become, the most retweeted photo of all time. First it was just Ellen and Meryl, until celebs from all different films, got up to get in on the action. 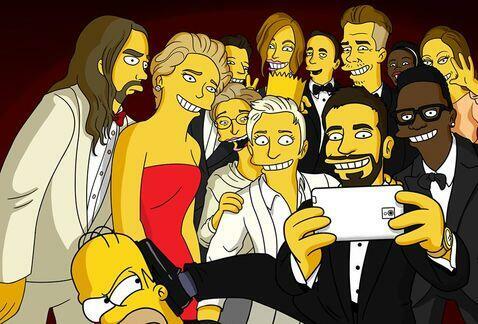 Ultimately, the star studded selfie was posted with no less than twelve A-listers huddled together, having a great time. Commence twitter overload in 3…2…1…. Seen by an audience of over 8,000,000 people on twitter, the selfie was retweeted over 15,000 times in the first few minutes of hitting the web. By early the next morning, the photo had been retweeted some 2,000,000 times, and in total over the last few days, the count has ticked over three million retweets. It took less than an hour for the image to shut down twitter, quite an incredible feat really. But it doesn’t stop there. Since it’s upload, the photo has also had the Simpsons treatment, and a remake in Lego as well. Not to mention being plastered across every social media platform the world over. My bet on who will feature in next years photo? Well, I think they should at least let Leo into it considering he is still Oscar-less. Yes that’s right, I have decided that today I am going to share some of the places from around the world that I would love to go, and just for poetic justice – all in 80 words. P.S. These words don’t count yet or else I would be practically finished when I haven’t even started. Firstly, I have always wanted to go to Bora Bora, such a beautiful place! Scotland, and Ireland in the summer looks just amazing. I cannot wait to visit Italy, and when in Rome toss a coin into the Trevi Fountain. Walking through Central Park, New York – enough said, and of course Times Square on new years eve. I would also love to go to Japan to experience the incredibly beautiful culture, I could really go on forever, but that’s eighty! Phew! So there is just a snapshot of some of the incredible places I dream of visiting, however, I really think it’s best summed up in just three words, “Around the World”. Here’s to you Jules!